This picture makes an attempt to show the sizes to scale. Let us assume the distance from Earth to Sun is 1 cm. At this units, our spacecrafts can travel one inch per year. want to courier a parcel to moon, it would cost you Rs. 6 lacs/ Kg. out of our solar system. 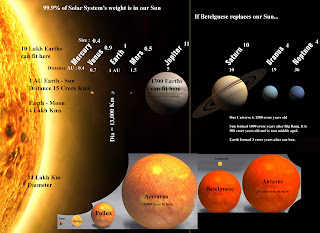 Our nearest star Proxima centauri is 2 miles away. sometime to get there !